Let's get this out of the way, A Ghost Story is not a horror film. Yes, it features a haunted house and a ghost smashing the crockery. But that's where the similarities end. The film stars Casey Affleck and Rooney Mara as the couple - we never learn their names - at the heart of this poetic meditation on grief, memory, time and existence. When Affleck's character dies in a car accident his ghost returns home to console his grieving partner. Ahead of its release in the UK, we talked to director David Lowery about how he made his film so haunting. 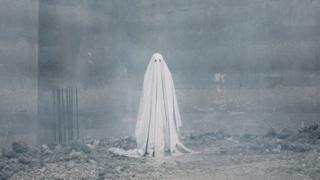 Why use a sheet for a ghost? "I've always loved that image," says Lowery, whose previous films include Ain't Them Bodies Saints - also with Affleck and Mara - and Disney's Pete's Dragon. "On our phones the emoji for ghost is a person in a sheet. We understand that to mean a soul who is not able to move on. It's a very heavy concept represented by the most child-like image. "At one point I had the idea of making a straightforward horror film like Poltergeist, but with the ghost represented by a guy in a sheet. But now I've used it in this movie so I can't do that any more." How did you stop it looking ridiculous? "It was trial and error to be honest," he admits. "It is a goofy image and we embraced it. There was a version of the movie that had a lot more slapstick, where the ghost was more comical. But as we were shooting it we realised more and more that just didn't work. "Even something as simple as the ghost walking from one room to the next had the potential for comedy. It looked silly. "We had to figure out a way to make it not funny. A lot of it was the costume design. It was very complex. We shot the ghost at a different frame rate so that the movement felt spookier and more ethereal." The costume, designed and built by Annell Brodeur, incorporated several layers of petticoats and a helmet designed to keep the actor's face aligned with the eyeholes. "You think it's going to be an easy concept just to put a sheet over someone's head, but it was so complicated," adds Lowery. "When the ghost looks over his shoulder we had to have everybody down on the ground holding the sheet in place so the folds wouldn't move in the wrong direction." Why does Rooney Mara eat a massive pie? The scene which has got everyone talking is where Rooney Mara's grieving character devours a chocolate pie in a static shot lasting several minutes. "I knew that I wanted there to be a moment where you feel her grief that was off the beaten path," says Lowery. "We have a scene of her crying in bed and it would have been easy to do another scene like that. But I felt there was a better way to do it. "I thought about times when I'm upset that I take solace in food. I think a lot of people do." Mara told Lowery before we shot it she'd never eaten pie in her life. She's also vegan, so it wasn't any old chocolate pie. "I knew it was asking a lot of her but she went for it - and it's probably the scene I'm proudest of in my career," says Lowery. "It's a scene I knew people would talk about. Everyone goes to this movie knowing Rooney's going to eat a pie." Where did the original idea spring from? The film opens with the couple arguing about whether to leave their Texas ranch home. Lowery explains it was based on an argument he has with his wife over whether they should move to Los Angeles from their home in Texas. "I'm a sentimental person and I like to stay in once place and put down roots. I get very attached to the homes I live in. And she's the opposite, she likes to keep moving. "We had an argument that felt like a scene from the movie - I even said so at the time. It was only a month or two after that the idea for this film came into being." Lowery turned his idea into a 30-page script within a matter of days. "It was very surreal to watch Rooney and Casey act that scene when we filmed it," he recalls. "My wife was on set that day and I remember her looking at me and rolling her eyes." What's with the film's unusual framing? Lowery chose to film using an almost square aspect ratio and softened the edges of the frame. "I've wanted to employ it for a while and this felt like the perfect opportunity to do it. It felt like an experimental film already," he explains. "Adding those vignettes on the corners was a way for me to see the film as an object. It imposes a window on the film, you're always looking though something to the image. "It helped me understand the movie better and it also added the slightest hint of nostalgia. It has the look of a slide projector image on a wall."